The sun was in its midmorning stretch as we motored into the Gulf of Alaska, 800-some miles and a time zone away from home. The steep hills in the distance and the dots of rock and islets along the shore were bathed in a gauzy purple, violet, faded blue haze. A couple of miles at sea, well away from the rocky coast of Chichagof Island, we turned south and let the gentle swells roll beneath the canoe stern of our 65-foot Malahide North Sea yacht. We began watching for Porcupine Rock, where we would turn toward shore for a sheltered anchorage. The sun, soaring higher and brighter, suddenly flashed through the haze to reveal forested slopes in precise and exquisite shades of green. There was no other vessel in sight and there was no wind, a rare condition on the edge of the gulf. The swells rolling in from across the Pacific Ocean were inconsequential, maybe a foot or two high. I felt comfortably stuffed from breakfast cooked by our Texas chef and savored a third cup of coffee in the sunshine while leaning on the bridge rail of the Ursa Major. Somewhere far behind us were the Aleutian Islands. Off to the right, over a million ocean swells, was Japan. Continue on this southerly course and the first landfall might be on a Pacific atoll. I&apos;m dreaming. I don&apos;t believe this. Pinch me. This is what I&apos;ve always wanted to do, and it&apos;s happening! For years, I have wanted to cruise the west side of Chichagof Island in Southeast Alaska. It is remote, far from any town or fishing port. Small inlets along the rocky shoreline provide excellent any-weather anchorage, and if the wind doesn&apos;t blow, cruising can be easy on smooth waters between Chichagof and islands scattered just offshore. Fishing is good, bear watching is fascinating and the scenery so spectacular it is beyond description. Most pleasure boaters don&apos;t go out there because of the open ocean and the loneliness of an undeveloped coast. There are no settlements on the west side of the island other than the tiny fishing village of Pelican, and the nearest large community is Sitka, far to the south. So the area offers a challenge: boaters who go are on their own. Time constraints and adverse weather conditions kept us away from this coastline on two trips to Alaska aboard our 42-footer. And, I must admit, there were concerns about heading into that remote and sometimes rowdy edge of the Pacific. The fantasies continued, however, and occasionally I would drag out the Coast Pilot to read about the west coast of Chichagof and wear a path on my charts by tracing routes with a finger. Finally getting there was serendipity all the way. 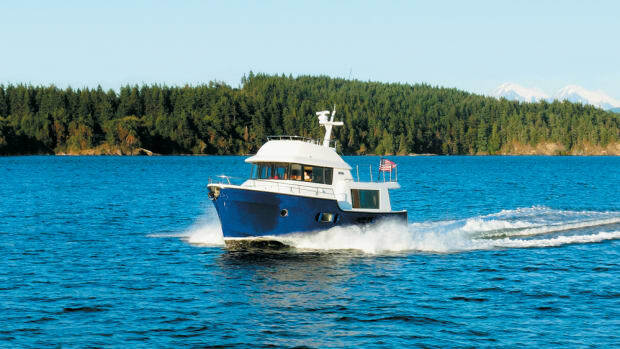 While gathering information for a story about the family of Malahide trawler yachts, I began talking with and exchanging email with Joyce Gauthier, a Seattle physician who owns Ursa Major. Her boat was the first Malahide built in the small seaport community of the same name just minutes north of Dublin, Ireland, nearly 30 years ago. She shared anecdotes and historical data and then made an irresistible proposal. Her Malahide operates in charter service in Southeast Alaska in the summer season, usually carrying six to eight passengers. The boat would be in Juneau in mid-August, and because the vessel was not booked the following week, she and the crew of three would make a six-day deadhead run to Sitka to pick up guests there. "Come join us," she said. Almost before we could say yes and thank you, my wife, Polly, and I were dragging our duffle bags from a cab at Auke Bay, a couple of miles north of the Juneau airport. We had no trouble finding Ursa Major in the big marina; her distinctive North Sea trawler styling can&apos;t be hidden. Southeast Alaska is such a wonderful place to cruise that we happily accepted the offer, thinking the yacht would cruise to Sitka via Stephens Passage, Frederick Sound and Chatham Strait, including a visit to the glaciers in Tracy Arm. We had done this several times but were willing to do it again and again. A few minutes after boarding Ursa Major and meeting the crew, Joyce asked if we&apos;d mind taking the coastal route in company with Explorer, a 60-foot Malahide that also is in charter service and which we had toured only a few minutes earlier. I said something smart, like "let&apos;s go." And we did. Captain Ron Miller, a veteran of decades of cruising and yacht deliveries, started the Caterpillar diesel. Josh Haury, the deckhand/ steward, and Richard Sharpe, a former whitewater river guide and now a chef, freed the spring lines and tossed the bow and stern lines aboard. Ursa Major was on her way to an adventure. It would prove to be remarkable for the fine weather, too: Each morning offered some ocean mist, but it soon cleared and we enjoyed sun, blue skies and calm seas. The wind began blowing on the ocean the day after we flew home. We did have some little doubts. On our two previous trips to Southeast Alaska, in our Grand Banks, we had worked long days. We planned routes and waypoints, hauled lines and lifted anchors, stood watch and cooked. We debated courses to follow and islands to bypass and worried through windy nights at anchor. Our concern aboard a charter yacht: What would we do with someone else doing all the work? It was a needless worry; there was plenty to do. Another bonus came to mind. This would be a pathfinder trip. We would determine if the west coast of Chichagof really was a place we wanted to go-and if we could do it. The Malahides were built for ocean cruising, with their lines taken from the tough fishing vessels that worked the North Sea and the dangerous coastal waters near Ireland and Scotland. Malahides were stout, and they did not receive a yacht finish. But both Ursa and Explorer looked good to me as we approached them in Juneau. Boarding Ursa Major is one easy step through a bulwark gate. The saloon, galley and dining area are on the main deck level. The pilothouse is up a ladder, and the staterooms and heads are down a fairly steep stairway. Handholds, however, make up-and-down fairly simple. The classic canoe stern shapes the cockpit. A ladder leads up to the sun deck, and a door opens to the saloon. A hatch leads down to the engine room. A powered capstan in the cockpit eases line handling in some situations and makes it easy to pick up a string of loaded shrimp traps. The foredeck is used to store a 12-foot tender, a fleet of kayaks and deck gear. A scuttle there leads down to the crew quarters. High above the deck is the pilothouse. Wing decks connect side doors with the sun deck that is aft of the pilothouse. A settee has space for visitors and a small room that doubles as ship&apos;s office, and the captain&apos;s quarters open to the pilothouse. A survey earlier in the year found Ursa Major to be in excellent condition. No rot was found, and the surveyor described her as "an outstanding example of old-world craftsmanship...( and) she will provide many more years of useful life." Joyce Gauthier has begun making improvements: paint, varnish, new rail caps, for example. There is more to be done, including updating some systems and the engine room. And every year there is a significant amount of routine maintenance to be completed off-season. There is no doubt Joyce loves the trawler. Before buying her, she watched it sit unused at a dock for several years and it broke her heart. Her goal is to improve the boat over time, to have Ursa earn her keep and to share her. "I wish I had a pristine engine room, all the bells and whistles provided for the boat, but she has to make a go of this as a business and we are just beginning our journey to restore her," Joyce says. "I don&apos;t have the kind of money to keep her for a plaything, and she has more important business to do in her job of spreading good will than being my boat." Explorer, which glistens in fresh green and white paint, operates a separate charter business. She&apos;s a slightly smaller version of Ursa Major, with a different interior arrangement. The big difference is the master suite built on the foredeck by a previous owner. 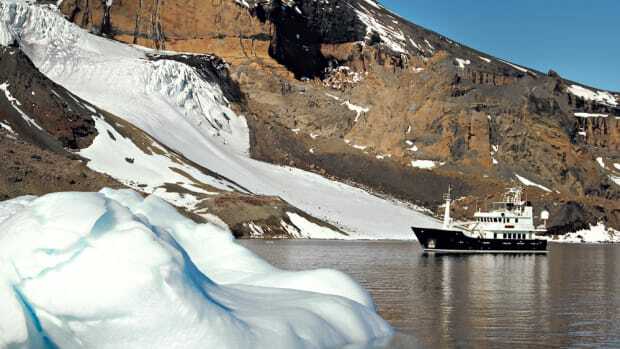 Richard Friedman, who owns Explorer, advised Joyce, as she began planning her charter business in 2000, that if one of the yachts has more business than can be accommodated, the other will pick it up. Also, in a charter situation when a large party needs more accommodations than either can provide separately, they will book as a joint package and the yachts will cruise together. Two nights after leaving Juneau, Ursa Major dumped her big anchor and 100 feet of chain into the muddy bottom of Dundas Bay, a narrow, sheltered inlet opening onto Icy Strait. It is west of and roughly parallel to the popular and better-known waters of Glacier Bay. It had been a fascinating day. Icy Strait was flat, calm and sunny, and we followed Explorer to Point Adolphus to watch humpback whales cavort. The rules say keep your distance from the whales, and we did. But they cruised past and around the two large yachts, blowing vapor into the sunlight and flipping their tails as they dove deep for lunch. We burned too much film, and Josh was on deck with the yacht&apos;s digital camera hoping for the perfect picture for a brochure. Captain Ron had promised we&apos;d go crabbing, so after the whales moved on, Ursa Major turned toward Dundas Bay. On the way in we stopped and dropped a couple of shrimp traps into deep water in a very specific place. Once at anchor Josh and I took crab traps across the bay in a 12-foot aluminum skiff and laid them in a line. Salmon had been jumping all around us as the big yacht coasted slowly to the end of the bay. After everything was settled, the crew launched a fleet of kayaks and Josh, Joyce and I paddled to the mouth of a small stream. Hundreds of salmon swam beneath my silent kayak but were spooked by my presence, or maybe by my shadow, and flashed away. Many of the fish were tattered and discolored from their long run from the sea, and some had developed the hooked snout characteristic of spawning salmon. They milled about in the shallows at the head of the bay, waiting for the signal to move on. It would not be an easy migration: We could see a waterfall just beyond the beach. There was another obstacle, one we could only sense might be there. Bears. Black and brown bears, the fish migration schedule fixed in their brains, come to the streams in late summer to stuff themselves on salmon. We saw no bears there, but Josh pointed out trampled grass along the shore and suggested they had been there. We had produced nothing from the sea for the table so Richard, the chef, was cooling wine and preparing dinner for six in a galley measuring five feet by seven. Seafood would be on the menu the next evening, we hoped. After a fine meal and rewarding conversation focusing on boating and Alaska, I went outside in search of the Northern Lights that had been predicted. A multitude of stars became visible as darkness finally arrived, but there were no flashing colored lights in the northern sky. Captain Ron rolled from his berth twice during the night for his own check, but the lights were reclusive. Ron turned the helm of Ursa Major over to me for the run across Cross Sound from Taylor Bay to the entrance of Lisianski Inlet. He went below to help cook the 18 big Dungeness crabs we had pulled aboard earlier and to check on the 12 dozen prawns that were in the traps we had dropped farther out in the inlet. I branded XXs on my mental chart of the area, so that we might someday try our luck in the same spots. Malahides have manual-hydraulic steering, and on Ursa it takes seven turns to spin the wheel from stop to stop. To make it easier and faster in close quarters there is a spindle-like brass device mounted on the face of the wheel. You grab it and crank-something like the knuckle buster on my &apos;41 Chevrolet. It was a device I would find on several more Malahides. I soon switched to the more responsive auto pilot system to keep the yacht on course while a mild current tried to push us out to sea. Steering a yacht that large is not much different than steering a smaller boat: Just point it where you want to go. The yacht began to roll gently in the ocean swells, and we switched on the active-fin stabilizers, a Vosper Thornycroft system apparently installed when she was built. The rolling stopped, and the only action was an easy rise and fall of the bow. We sliced down the middle of Lisianski Inlet bound for a night on the dock at Pelican, a small fishing community whose buildings stand on pilings and whose main street is a boardwalk. Captain Ron claimed the helm, and I&apos;m glad he did. A wind estimated at 20 knots was gusting up the strait and across the dock that had space for us. The wind would be on Ursa Major&apos;s port side as she moved in for a landing. Worse, the dock had sort of an "L" shape, with a small building on the part of the float that jutted into the waterway. Ron had to jog in without wiping out the building. Remember, Ursa is 65 feet overall and weighs 109 tons. While Ron approached every landing at dead slow and maneuvered at idle speed, the yacht takes a long time to stop and with its tall pilothouse has some windage. A miscue by line handlers on the dock prevented the deck crew from getting a spring line ashore on the first attempt. The wind began blowing the stern off and toward a couple of nearby fishing boats. Working the engine and gears and spinning the wheel with the aid of the brass spindle, Ron quickly lined up Ursa for a second and successful landing attempt. Pelican is a fishing community of about 125, with a processing plant, a general store, school, library, two bars and a stream full of spawning salmon. I vowed to buy a pair of brown XtraTuff boots at the store, but it had only sizes 8 and 13. So, we joined the crew in a visit to Rosie&apos;s, a bar popular because of its dramatic and spirited owner. Other than drinking beer and joshing with Rosie, much of what goes on there is Xrated and not repeatable here. Thinking about it, much of the conversation with Rosie was Xrated, too. Huge cruise ships carrying thousands of passengers frequently are sighted in Southeast Alaska, but not offshore of Chichagof Island. Having been on several of them, I began thinking about the benefits of cruising aboard small, family-style charter boats that carry six to 12 passengers. The love boats cruise mostly at night, denying their passengers the opportunity to enjoy the passing scene. Ursa Major and Explorer and others like them move only during daylight hours, guaranteeing maximum exposure to mountains, the sea and wildlife. Nights are spent safely at anchor or alongside a dock. Another: Captain Ron welcomed guests in the pilothouse at all times. We often carried our morning coffee up the ladder to the pilothouse to watch the world from that lofty place and to talk with him about boating and Alaska. You don&apos;t do that on a love boat. The big guys have swimming pools, gymnasiums and dance floors. Ursa doesn&apos;t. No one missed them. The little guys carry a few passengers (probably family members or friends), not hordes of strangers in an impersonal atmosphere. And, finally: We had to be in Sitka Thursday afternoon, but where we went and stopped before then was up to us. We could decide today but do something different tomorrow. We could paddle after bears instead of fishing for salmon. 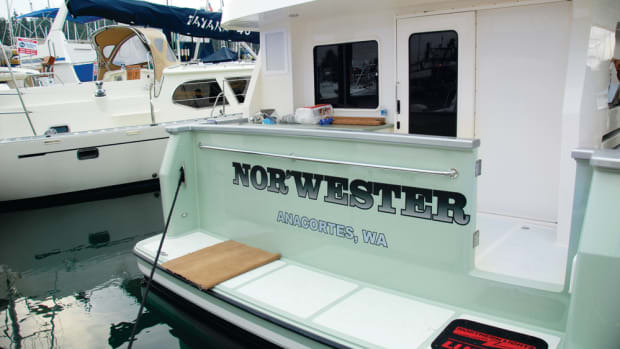 The flexibility of small yacht charters became evident as Richard Friedman took his Explorer toward the north end of Chichagof to satisfy his clients&apos; desire to fish for big salmon. We didn&apos;t care about catching salmon or carting them home on the airplane, so we headed south toward the thicket of rocks and small islands that abound offshore, looking for a way to banish the pangs of Rosie&apos;s.
With the anchor down in Porcupine Bay, Josh, Richard and I took the tender and sped south a couple of miles to Bertha Bay and White Sulphur Springs. It is a pretty neat place and appears to be well used despite being a long way from anywhere. Although many generations of native Americans were content to soak in the hot water as it cascaded across the rocky beach, a frame building now encloses a pool created by cementing rocks together. This is courtesy of the U.S. Forest Service. The water has a faint odor of sulphur and is delightfully hot//several degrees warmer than is recommended for the hot tub on the patio. The ocean side was open when we arrived, but we quickly noted that it has sliding glass doors that may be pulled shut in bad weather. Although signs prohibit carving names on the shelter&apos;s walls, hundreds have done so. The oldest was chiseled in 1975; the newest name was Ursa Major, in an inconspicuous spot. After a while, feeling restored but coming close to dissolving in the hot water, hunger began to overwhelm the need to soak and we decided to take the chef back to the yacht so he could return to work. Although we had been consuming huge amounts of cracked crab and steamed prawns, the idea of more seafood remained appealing the following day. It was time to go fishing. Ron steered Ursa Major through Imperial Passage and into an inside waterway winding between offshore islands and rocks and the west side of Chichagof. He consulted a chart and let her drift to a stop that looked likely. Working from the fantail cockpit, I jigged for bottom fish. Little happened, so Ron moved us a couple of hundred yards to another likely looking spot. Bingo. Soon I had a bucket full of excellent fish, including lingcod, golden eye and various kinds of rockfish. On my boat, I clean and fillet fish. On Ursa Major, Josh removed the hooks and tossed the fish into the bucket. They disappeared until the next evening, when Richard served the best fried-fish dinner I have ever eaten. I don&apos;t know if there are fish in Alpine, Texas, where he operates a restaurant in the winter, but Richard knows how to cook &apos;em. Our last night in the wilderness was in Ford Arm. As usual, Ursa was the only boat in the anchorage. Captain Ron took us back to sea via Piehle Passage, a winding route through scores of rocks and small islands. I photographed the passage but thought that only an artist could truly capture the essence of the sun, the ocean mist overhead, a wrinkled sea below and the weatherworn islands. The Coast Pilot says Piehle Passage is used extensively by boaters with local knowledge "but is difficult for strangers." Strangers would jog north a few miles to Khaz Bay, a broad opening to the ocean with few obstacles. Even those with local knowledge seek out the Khaz Bay route in unsettled weather. As we neared Sitka, traffic increased. We had seen only two yachts (both sailboats) on our trip south, so we watched carefully as work and fishing boats appeared on the horizon and then passed us. It was late in the pleasure boat season, and most yachts were en route home to the Lower 48. That was wise, because stormy weather soon brought wind and rain to the coast. Our path-finding mission convinced me that the west coast of Chichagof Island is a splendid place to cruise, offering fabulous scenery, abundant wildlife, a wilderness experience and the opportunity for adventure. Traveling aboard the Ursa Major was a rewarding way to experience it all. I am also convinced that smaller boats, like our GB, can make the coastal trip safely and with the same enjoyment as long as their crews heed weather forecasts and plan carefully. 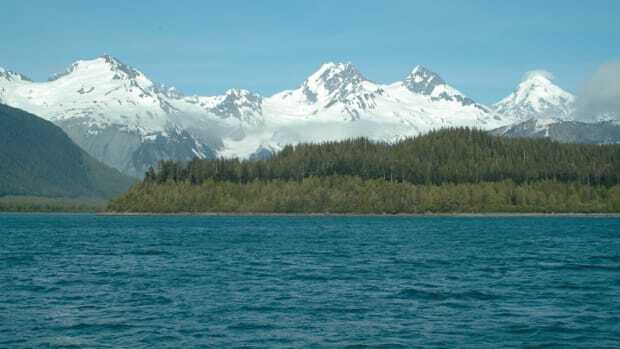 An acquaintance, a veteran Alaska cruiser, recently told me "there are 100 lifetimes of cruising in Southeast Alaska." I believe him, but having used up some of those lifetimes, I&apos;m keeping the west coast of Chichagof at the top of next year&apos;s list. I only wish we had space for that great crew//Joyce, Ron, Josh and Richard. In our next issue, we look back at the Malahide trawlers of Ireland, and a special woman who restored Ursa Major for the charter trade.